High waves caused by Typhoon Lan break on the shores of Senjojiki, Shirahama town, Wakayama prefecture, Japan, in this photo taken by Kyodo October 22, 2017. 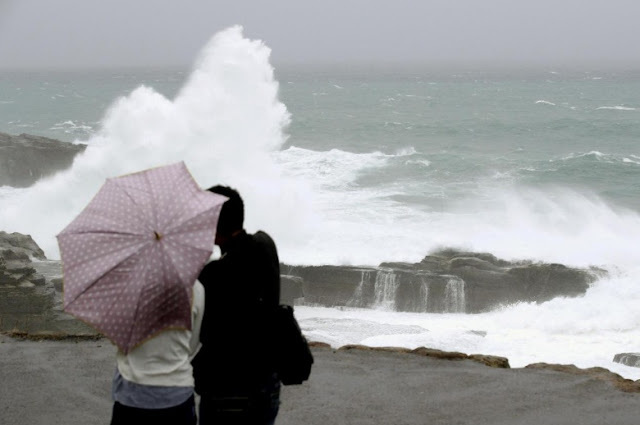 TOKYO - Tens of thousands across Japan were advised to evacuate, hundreds of flights were canceled and rail services disrupted as heavy rain and wind lashed a wide swathe of Japan on Sunday, a national election day, as a powerful typhoon neared. Typhoon Lan, classified as an intense Category 4 storm by the Tropical Storm Risk monitoring site, was south of Japan and moving northeast at 40 kph on Sunday afternoon, the Japan Meteorological Agency said. An agency official told a news conference that while the storm appeared to have weakened slightly from its peak, it was still a powerful storm that could pound parts of Japan with more than 80 mm (3 inches) of rain an hour and might make landfall near Tokyo early on Monday. “It will make landfall as a strong typhoon,” he added. More than 20,000 households in various parts of Japan were advised to evacuate, NHK public television said, though there were no immediate reports of damage or injuries. Japanese Prime Minister Shinzo Abe said he had called on the government to take steps as early as possible to minimize any threats to people’s lives. Media reported the grounding of flights and interrupted rail services in southern and western parts of the country. Wind and rain were intensifying in Tokyo. The bad weather could hinder voter turnout in the general election, where Prime Minister Shinzo Abe’s Liberal Democratic Party-led (LDP) coalition is on track to roughly match the two-thirds “super majority” it held in parliament’s lower house before dissolution. Divisions in the opposition camp and jitters over North Korea’s nuclear and missile programs are likely to help the ruling coalition, media forecasts have said. Tens of thousands across Japan were advised to evacuate, hundreds of flights were canceled and rail services disrupted as heavy rain and wind lashed a wide swathe of Japan on Sunday, a national election day, as a powerful typhoon neared.